For some time, Brightline has been establishing itself as a provider of privately owned Intercity services in Florida. It seems this has taken the interest of the Virgin Group, who are partnering with Fortress Investment Group to bring Virgin Trains USA. Brightline will transition from its current branding to Virgin Trains USA during 2019 as part of a strategic partnership and trademark licencing agreement with the Virgin Group. Brightline currently links Miami Central, Fort Lauderdale and West Palm Beach, with plans to link to Orlando International Airport and Tampa, using Siemens Charger locomotives with four passenger cars attached. Once the Orlando connection is completed, it is planned the trains will be lengthened to 7 coaches each. Currently, 10 train sets are in service. Virgin Trains USA will be made up of a minority investment by Virgin Group, whilst Brightline will be managed and operated by Brightline’s executive team and affiliates of Fortress Investment Group. 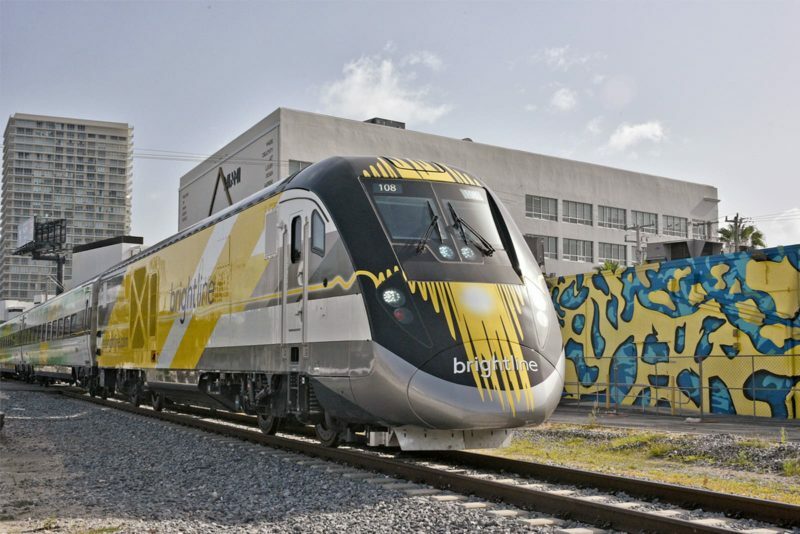 As well as the Florida train service, Brightline is planning to it commence construction next year to connect Las Vegas to Southern California after taking over planned XpressWest link programme. The move by Virgin Group into rail in the USA is an interesting one. Brightline’s programme so far has been limited – but has offered interest to those who don’t want to use cars between Miami and Fort Lauderdale and West Palm Beach, covering the distance in three hours (versus four hours in a car). Whilst it could encourage a modal shift from car to train, there are potential tie ups within the Virgin Group too (be it through Holidays, Virgin Atlantic, hotels, etc) which could add revenue. For a railway like this, Virgin’s money will be welcome. What it does with that money next will be what to watch out for. I recently had the chance to try Brightline and was very impressed! I’m not sure how it can survive on its own, but it was quite high quality. I used all three stations and they were like mini-airport terminals. They had ticket gates, security screening, and then a waiting / lounge area with a cafe. Good wifi, toilets, etc. Just to clarify, the travel time Miami-West Palm Beach is 1 hour and 14 minutes each way (not 3 hours – that is the planned future time between Miami and Orlando I think). Each segment is between 35 and 40 minutes. This is pretty similar to the optimal driving time (via the parallel I-95 expressway), but driving time can go up to about 2 hours in traffic.